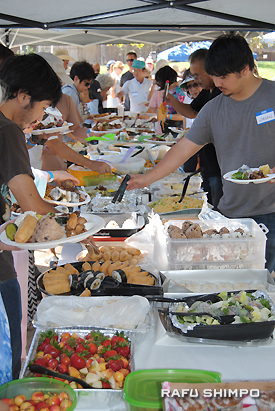 Participants enjoyed barbecue and homemade food. A newborn baby and 90-plus-year-old member were among those who gathered at the Nanka Kanagawa Kenjinkai’s annual picnic on July 13 at Wilson Park in Torrance. 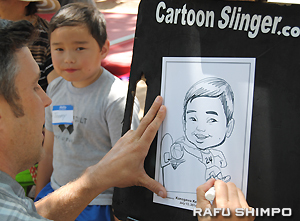 About 150 participants enjoyed barbecue, homemade food, mini-sports games, Taiko performance by West Los Angeles Buddhist Church, and caricatures by an artist. Frank Kawase, the kenjinkai president, welcomed the gathering and expressed appreciation for members’ help in organizing and hosting the group’s 106th picnic. At the opening ceremony, long-time members Jack and Nobue Puchalski were honored and recognized for their many years of support for the Kenjinkai activities. 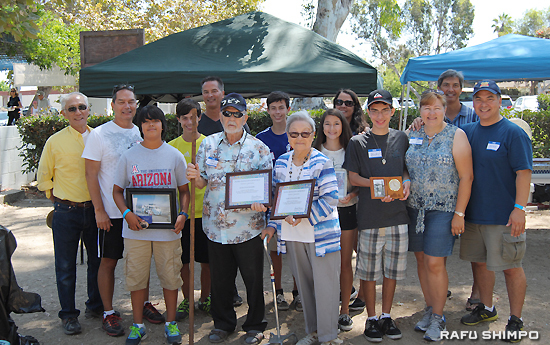 Surrounded by their children and grandchildren, the pair received a certificate of appreciation presented by Kawase. One of their grandchildren, Blake Puchalski, read the couple’s bio. Jack and Nobue met in Yokohama, Kanagawa Prefecture in 1946, where Nobue was born and raised. After raising eight children and doting on 19 lucky grandchildren, Nobue found an article in Rafu Shimpo about Kanagawa Kenjinkai. They have been looking forward to its New Year parties and picnics ever since. An artist draws a caricature of a member, Jonny. When Issei first established the Kanagawa Kenjinkai in 1908, the group served as their lifeline in many ways. However, as time passed with no new immigrants arriving from Japan, the purpose of the group has drastically changed over the years. After Kawase became the first Sansei English-speaking president in 2009, he struggled to maintain ties with the Kanagawa Prefecture as well as Japanese-speaking members because of the language barrier. To improve communication and understanding, he elected a few Japanese-speaking members as board members, and the plan worked. Membership has been slowly, but steadily increasing since 2009 and current membership stands at 90 families and 240 members. Kawase has seen a recent influx of not only Japanese-speaking members, but also a diverse set of new members as a result of interracial marriages. Later this year, Kawase will reach the end of his five-year term as president. However, he will continue to support the Kenjinkai as an advisor. On his most recent mission, he traveled to Japan in early July and met with staff members at the International Division of the Kanagawa Prefectural government. 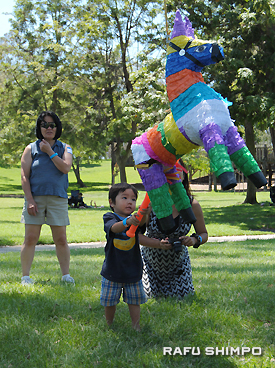 Children enjoyed playing with a pinata. There, he reported on the current circumstances surrounding the Kenjinkai, and confirmed the organization’s interest in a sustained collaborative relationship with the prefectural government. He also hopes to start a new initiative: creating opportunities for the Southern California-based Kanagawa Kenjinkai community to interact with members in other cities and countries such as San Francisco and Brazil. Bob Uyeda, Sansei President-elect, has been a member of the Kenjinkai since childhood. His parents used to take him to the picnic every year, and it has become one of his family traditions to participate in the group’s events. After second and third generations have passed, many Kenjinkais now question how relevant the group will be to younger generations. Uyeda understands the importance of preserving the group because this is the place where people learn about their family roots—their cultural and ancestral history. “Even though we don’t have the direct cultural tie, we have an appreciation of the culture,” said Uyeda. He hopes to find fun ways to keep this organization alive for the future generations. He will be inaugurated as the president of Kanagawa Kenjinkai at the next New Year party in Feb. 2015.